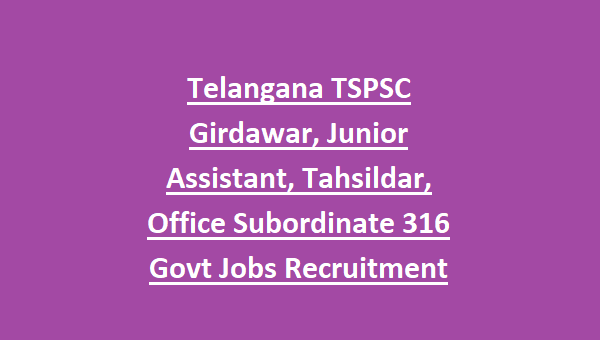 Subordinate and Girdawar in this TSPSC Recruitment 2018. Candidates who qualified Degree they are eligible to apply online for this TSPSC Recruitment 2018. Eligible candidates can submit application form online for this TSPSC Tahsildar, Junior Assistant Jobs through tspsc.gov.in website on or before 00-00-2018. 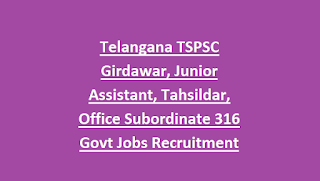 For more details regarding this TSPSC Recruitment of Tahsildar, Junior Assistant and Girdawar, Office Subordinate jobs selection process, exam pattern, Exam syllabus, age limits, pay scale and other information is given below. Age limits are applicable as on date 18-44 years for General candidates, For SC/ST/BC candidates age limits are applicable as per the norms. For all the posts degree qualification is required. Objective type written exam will be conducted for this TSPSC recruitment Tahsildar and other posts. Exam will be Computer based online test. Apply online for this Telangana Revenue Department Jobs Recruitment of Tahsildar, Girdawar and Junior Assistant, Office Subordinate Posts. Online applications submission last date is 00-00-2018 through official website of TSPSC @ www.tspsc.gov.in. Exam Pattern, Exam Syllabus pdf, Exam date, admit card released date and other details are updated in this website in due course.